This is Tina. I had the interview with you in December, for my discovery project! I am now almost done it ! I did a “waste game show” and I wrote a letter to my principal (and head mistress) to remove plastic utensals and styrofoam in the cafeteria. She mentioned it in assembly, and they might be removing it for next year! I am now created so much less waste! Thanks so much for doing the clean bin project! It was very inspiring to me! That is so awesome Tina! Your work to improve your school is pretty inspiring. And a waste game show is a great idea – would love to hear more about it. 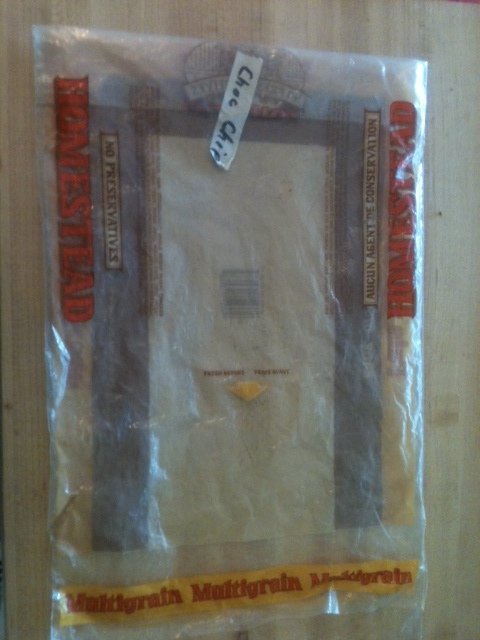 Before the use of plastic bags bread use to be sealed in waxed paper with printing on the outside. A partial roll is still at your Grandmothers, and thank you for saying I’m only in my 50’s. Ha ha – late 50’s – very early 60’s – they’re very close aren’t they? Interesting how the paper bag stuck around for companies, but I’ve never seen that wax paper type of packaging. So I can totally relate to the high quality plastic bags that draw on a memory. My grandmother used to make crocheted hand towels and she used a high grade plastic bag to store them. It’s been ten years and I still have a few of those towels ‘new in bag’ stored away. I appreciated the honesty and the nostalgia in your writing. I appreciate you posting this, thanks.